The constitution of the Walworth County Agricultural Society was adopted April 28, 1842. The first annual fair and cattle show of which we have any record was held in the Village of East Troy on October 16, 1850. A total of 35 first premiums, 17 second premiums and 3 third premiums were given at that time. The first County Fair held in Elkhorn was in 1851, and again in 1852, in the block southwest of the City Park. In 1853 the fair site was moved to Delavan but returned to Elkhorn in 1854. In 1855, the first purchase of land, from Colonel Edward Elderkin, was made consisting of six acres within the Village of Elkhorn limits. The cost was $100.00 an acre with 10% interest, a high price for the time. The city of Elkhorn donated $300.00 to fence the land, erect pens and sheds and to dig wells. The fair site has remained in Elkhorn since 1855 on this same location. Many visitors of the Fair at that time came by train. At one time, there were 19 Special Trains which unloaded daily and left again each evening after the races from the fairgrounds. They came from Libertyville, Rockford, Freeport, Walworth, Beloit, Madison, Janesville, Milwaukee and Waukesha. 1933 was the beginning of night shows like the WLS entertainers, at the Walworth County Fair. 1933 also marked the 1st year that the Fair opened on Sunday. Today, the acreage owned by the Association is approximately 99 acres. The land and buildings are now valued in excess of one million dollars. 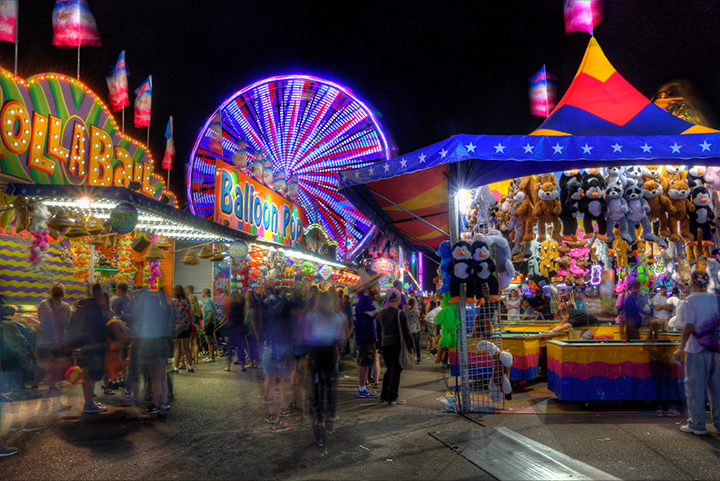 During its existence the Fair has received the support of the entire community. This support is shown by the gradual increase in its receipts. The increase in interest taken in the Fair has been proportional to the increase in receipts, and the success with which the Fair has been due not only to the solid foundation upon which it was laid, but also the united support all members, regardless of their social position, political views, or creed.